Of all the blurbs I’ve come across in recent years claiming to be “like Game of Thrones”, I have to admit Luna: New Moon came quite close – if you can imagine the Starks and Lannisters as two rival families with competing mining operations on the moon. The first book was like an epiphany; I loved it. That I’m looking forward to this sequel and conclusion (the series is just going to be a duology, I hear) is a massive understatement. I’m hoping Luna: Wolf Moon will be just as amazing. ← #RRSciFiMonth Spotlight: Cyber World edited by Jason Heller & Joshua Viola + Soundtrack Giveaway (Int’l)! Ooh nice! That’s a totally new to me one! Not sure that it’s my kind of read but I hope you positively love it once you read it! 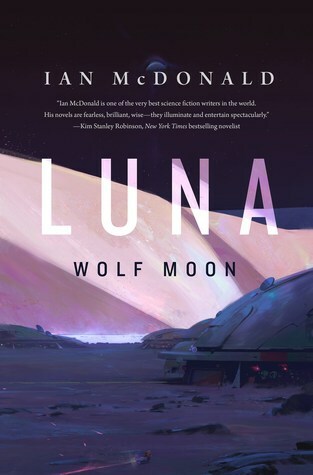 I have a few Ian McDonald titles on my TBR list, but haven’t gotten around to him yet. I had no idea this is a duology! I haven’t read the first book yet but already have a copy. Was just waiting to read the books closer together. Glad to hear the wait isn’t as long as I thought. Great choice – and lovely cover! OK, comparing to Game of Thrones is an easy way to peak my interest. This is new to me but that cover- wow. Got my attention.